ClassicArabia.com - Our Blog: ClassicArabia.com Goes Racing! 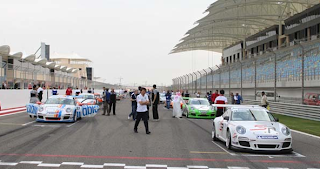 The Porsche GT3 Cup Challenge Middle East, an exciting new one-make motor racing series attracting some of the region’s most promising young drivers. Driving for the ClassicArabia Racing team for this Porsche GT3 Cup Challenge, is 16-year-old Saudi national Fahad Algosaibi making his own piece of racing history by becoming the youngest driver to compete in a Porsche worldwide. He has just completed a season in Asia Formula BMW racing where he secured an impressive top five finish. ClassicArabia.com is thrilled to be behind the ClassicArabia Racing team in this event. We are an active promotor of motor sport events in the region. This includes the regional SpeedTrip events, The Bahrain H.O.G. ™ Rally, and last but not least the E-RAIN Forumla BMW team. ClassicArabia.com is a pan-arab online classifieds website. We specialise in Cars, Bikes, Property, Boats, Art and Watches. Join our exciting online community TODAY! We're celebrating Cheese Pizza Day....are you? Longest Days of Summer.....Let's Go Boating! Common' buying property isn't a bad thing! 60% of businesses will FAIL within the first 5 years! ClassicArabia.com Blog | Copyright 2011. Picture Window theme. Powered by Blogger.